We can now pore over every curve and every spec of the Galaxy Note 9, but you might be wondering how the upcoming handset holds up against the other phones of 2018 – and specifically in this case, the Huawei P20 Pro. Well, we're here to fill you in. We're going to put the best that Samsung has to offer and the best that Huawei has to offer up against each other in all the categories that matter – the design, the specs, and the features that these two excellent smartphones have to offer. Huawei has definitely taken a leaf out of Apple's book with the Huawei P20 Pro – look at that distinctive notch up at the top of the display, a design touch you definitely won't find on the Samsung Galaxy Note 9. Both phones push the bezels right to the edge of the front display, but the Note 9 screen is slightly larger – 6.4 inches rather than the 6.1 inches offered by the Huawei P20 Pro. The P20 Pro also still has a fingerprint sensor on the front of the device. The Huawei P20 Pro is by no means ugly, but we'd have to say the Note 9 just edges the contest in terms of design, based on early impressions. The Samsung Super AMOLED displays really are glorious to look at, and the aesthetics of the Note have been perfected over several years. 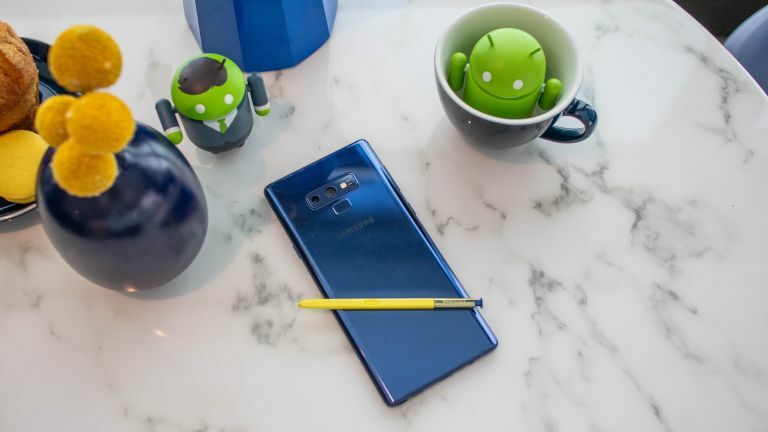 The Note 9 features an Exynos 9810 or Snapdragon 845 processor inside, depending on where in the world you are, and that's broadly comparable with the Kirin 970 found inside the Huawei P20 Pro. Neither of these phones are going to be found wanting in the performance department. The Note 9 is really going to town with the other specs though: up to 8GB of RAM and up to 512GB of storage space with the top configuration. The Huawei P20 Pro, for its part, maxes out at 6GB of RAM and 128GB of storage space. Where the Huawei P20 Pro really stands out is with its camera, a triple-lens 40MP + 20MP + 8MP beast that's capable of some super shots. The Note 9 is no doubt going to be an excellent photo-taking device too, given Samsung's reputation in this area, but it's settling for two 12MP + 12MP lenses around the back. The Note 9 S Pen stylus is clearly one of the stars of this particular show. The unique selling point of the phone comes with more capabilities this year, including phone unlocking and playback controls. The Note 9 also has the edge in offering wireless charging and a 3.5mm audio port, neither of which you'll find on the Huawei P20 Pro. The Samsung phone's IP68 rating for dust and water just beats out the IP67 rating for the Huawei handset too. It's that triple-lens camera and everything you can do with it that really makes the P20 Pro from Huawei stand out. In most other categories, including the extra features, the Note 9 might just have the edge. That excellent camera aside, the Note 9 seems like it could be the better buy than the Huawei P20 Pro, but that doesn't mean it's the right choice for everyone – the P20 Pro is a fantastic phone in its own right, especially for serious mobile photographers. We're keen to test out what Samsung has managed to do with the S Pen this year, and even if the Note 9 doesn't add much to the Galaxy S9 Plus formula, it's still undoubtedly going to be one of the phones of 2018 no matter what Apple and Google bring out. The bottom line is you can't really go wrong with either of these phones, and the decision ultimately comes down to whether you prefer an innovative stylus or a ground-breaking triple lens camera – everything else on these handsets should be more than enough for whatever you need.